Categories: Dining Cards, Virginia Dining Card. For just $39.99, KidsDineFree.net members can get a twelve-month card that entitles them, to one FREE kid’s meal with each purchased full price entrée. Each card lets children age eleven and younger eat free at all participating restaurants. One free meal per card, multiple children would require multiple cards. Your card can be used as many times as you like during the valid One-year period. The more you eat out, the more you save! FAMILIES ARE ALWAYS LOOKING TO SAVE MONEY WHILE STILL SPENDING QUALITY TIME TOGETHER. THAT’S WHY MOMS AND DADS ALIKE WILL LOVE THE KIDSDINEFREE.NET CARD. IF YOUR FAMILY EATS OUT AT LEAST ONCE A WEEK, THEN YOUR SAVINGS CAN REALLY ADD UP! IN JUST THREE MONTHS TIME, YOU CAN SAVE $60.00 OR MORE. AND IT DOESN'T MATTER IF YOU USE YOUR CARD AT BREAKFAST, LUNCH OR DINNER. OR ALL THREE! 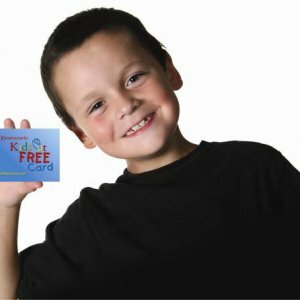 For just $39.99, KidsDineFree.net patrons can get a twelve-month card that entitles them, to one FREE kid's meal with each purchased full price entrée. 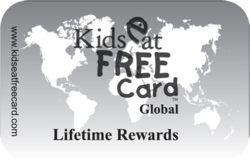 Each card lets children age eleven and younger eat free at all participating restaurants. One free meal per card, multiple children would require multiple cards.